An essential resource for trade unionists, labour rights organisations, NGOs, researchers, governments and policy makers, and for anyone interested in the history of labour unions, the right to organise, freedom of association, and worker's organisations around the world. Each country profile in the encyclopaedia is a labour movement fact file and describes the political, economic and legal context in which trade unions operate, outlines key facets of labour law, and looks at the historical development of unions up to the present day. The global compendium contains data on thousands of unions. 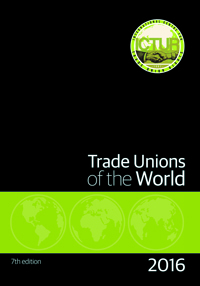 Trade Unions of the World also contains profiles on all major international trade union organisations. Published June 2016. 678pp, softcover. Trade Unions of the World can be ordered on this page using the PayPal payment service or by alternative payment methods (bank transfer, invoice, cheque, etc). Please contact us on ictur@ictur.org to make approriate arrangements. Orders placed online or paid by bank transfer receive a £5 discount, payment by cheque is at the rate of £145 for single copies and £500 for five copies.